This is quite an eventful post! So many things to cover: a busy day of WiFi sessions when Citàlune had a high turnip selling-price, an exciting new neighbor moving into town, gardening and public works progress around town, and lots of internal debate over the Café’s location. I’m going to ask you all for opinions about that at the end of this post, but first I have to tell more about my town’s happenings lately! I hadn’t bought turnips the Sunday before and was resigned to not being able to take advantage of my town’s great turnip price, but CK came to the rescue by setting her town’s date to Sunday and letting people come over to buy turnips! So I got to explore CK’s beautiful town of Bluebell again while searching for Joan, and then I bought as many turnips I could carry. I opened my gates again so that others could continue to come sell turnips, and Ryann and Will came back over, along with Liam (he’s the one wearing headphones). Ryann had an idea for a fun villager guessing game in which she would give hints about a certain villager (clothing, appearance, etc.) and we would guess who it was, winning a prize if we guessed correctly. I did pretty well at the game, winning myself a Triforce, stained glass, and female mask. 😀 Thanks a lot for the prizes and for running the game, Ryann, it was a nice surprise and a lot of fun! Will and I watching in awe as Liam swims in the river! I didn’t know about this glitch, but it’s cool since you can’t swim in the river otherwise. I love this house in Shantaki, such a cute cottage feel! Having a group prayer together seemed to do the trick! Then we were finally able to go to the island successfully and tour. Thanks a lot to everyone for the fun WiFis! 😀 It felt weird to be having so many people over because my town was seriously under construction (I was in the middle of working on paths and flower-rearranging), but everyone was nice and understanding about it. Now I’ve received one mannequin each from Mabel, Sable, and Labelle. I assume I’m not going to keep getting new mannequins forever, so maybe this is the last one? And is it just me, or is Labelle getting friendlier? I thought that only happened with Sable! I liked Melba’s house better how it was before; it reminded me of a cozy candy cottage in the woods of a fairytale, and it heavily inspired how I decorated my main room in AC:WW. Now it’s a little plain, but oh well. Sylvia’s leaving, and I’m letting her go. Nothing personal, but like pretty much every single one of my original neighbors, her house is in a bad location. Another community project requested that’s too modern for the feel I want for my town. I remembered to see K.K.’s show this past Saturday! I forgot the week before, so this was my first time. He doesn’t accept requests for the first performance, so I especially look forward to next time (if I remember to go >_<). I lined the paths on the “city” side of town with lilies, which looks bright and sunny, and I have violets lining the paths on the “natural” side of town (the side with the town tree), which has more cool colors. 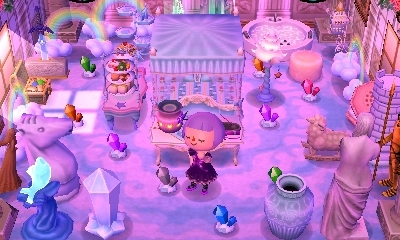 I’m also hoarding lots of lilies and violets on my town’s beaches, for when I work on more flower re-arranging around town. While working on planting flowers, I noticed some path-like grasswear here (usually covered by patterns). I don’t have this sort of grasswear elsewhere in town yet, so I assume this spot must’ve had a lot of dirt since the beginning. I’ve changed the area in front of Estel’s house a lot recently: from the trees and flowers to the community projects I use to repel villager houses — fountains now, instead of benches. This style of fountain reminds me of one you might put in front of an official-looking building, like a bank, not one that would be found in someone’s garden, so I don’t plan to have these fountains here forever. I hope the statue fountain is requested, I think those would be more fitting here. There was a rainbow in town — not the best time for one since my town’s messy and under construction (I know I say that a lot, but it’s true 😛 ) — but it was still nice to see! This was a pleasant surprise! Didn’t think I’d done that many favors for my neighbors. I like the way the sunset affects the colors of this path! I’m sure I’ll end up demolishing these eventually, but I’m trying to work towards perfect town status. I helped out Gulliver again; he does seem more common in this game, which I like! His destination this time had less obvious clues than the other ones so far. Not sure which I like better. Anyway, I don’t necessarily want to pigeonhole a certain look for Estel (like I did with Twisk in AC:WW), so I’ll keep my options open. I went to my dad’s town today to sell turnips — not a huge price, but enough to make a profit. I thought this tropical-themed room of my dad’s was pretty impressive for only a month or so of playing, and July’s DLC (the palm tree lamp) is perfect for it! And finally, as the title suggests, I’ve been spending a lot of time debating about where to put the café. I think there are two good potential locations: one in a nook of the river (which is what’s shown in the preview above), and one at the end of a row of buildings formed by Re-Tail, the train station, the town hall, and Lyra’s house (so it would almost be like a second main street). Here are two maps showing exactly what I’m talking about in case you want to see and provide input! 🙂 The position of Lyra’s house changes depending on where I decide to put the café. In this option, the café is in the nook of the river that’s near the center of town. It’s a scenic and beautiful location (similar to what I loved when visiting Shantaki’s café earlier in this post). In this option, Lyra’s house has more space for its own large personalized garden area. In this option, the café would be in the upper right corner of town. It’s not the most scenic location, but I would plant trees and flowers around it, and like I mentioned before, it would add another building to a sort of second Main Street. It would also free up the nook in the river (option 1’s location) for something else, like a special garden or park area. Lyra’s house would be very close to the town hall in this option (to make room for the café being nearby), so Lyra’s house wouldn’t really be able to have its own large garden. Her garden would probably just be merged with the town hall’s garden. 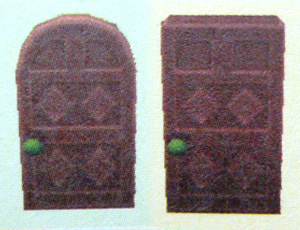 However, since I plan on having the fairy-tale exterior decorations for both the town hall and for Lyra’s house, it might actually look nice for them to be that close to each other. 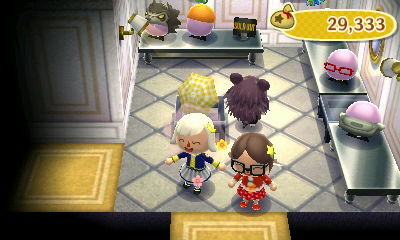 Posted on July 18, 2013 by Amy •	This entry was posted in AC:NL, AC:NL WiFi, Citalune and tagged Animal Crossing. Bookmark the permalink. Thank you! 🙂 Progress is still pretty slow on my end as well; it seems like I get maybe 2 requests a week, and of course, not all of them are good… I’m finally (and somewhat reluctantly) building more projects in an effort to raise my citizen satisfaction rating. Thanks a lot for the input about the cafe! I agree, it seems to be between an isolated, scenic place vs. joining the busy north part of my town. How did you get Liam to swim in the river?! I mean, you mentioned a glitch, but how did you trigger the glitch? You can get four mannequins in total, haha! Congrats on getting three of four! The last one is given from Gracie, so it might be a while until unlocking it. Wow, congrats on the silver an too! It’s always irritating how the campers are constantly asking for my can, since they can’t inquire about silver tools, and it’s the only regular tool I still have! 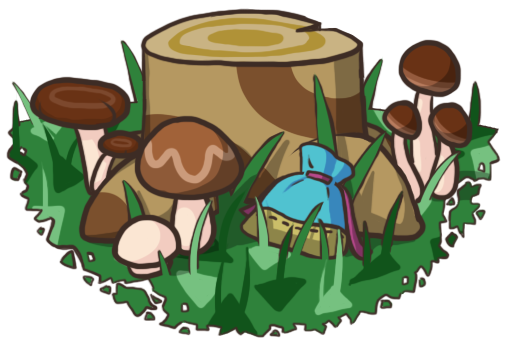 >.< But I'm pretty bad for buying from Leif – my villagers plant too many flowers that they think my town needs as it is! Still haven't decided on your cafe location? I guess it can't be demolished,after all. 😛 I think you should go with cafe option number 2! Reason 1: I think you should save the nook in the river for a flower bed- how pretty! Reason 2: A Main Street in town would be super convenient! Yeah, I liked the house a lot actually! 😀 Didn’t think there was anything wrong with it. Unfortunately there isn’t really a door with the exact shade of pink as the roof (if that’s what’s bothering you), so I think the lighter pink door with the darker pink roof looks fine. But if you’re looking for a door to match the chalet wall in general (and not just the roof), I think the loghouse door or brown door would look good. And then maybe a hedge fence (edit: oh right, you already have that :P) and either a pink mailbox (to match the pink roof) or a barrel/wooden mailbox (to go with the cottage-style aesthetic of the wall). I always have trouble with the pavement; I’m so used to the cobblestone in every single AC game that some of the new pavements seem too eye-catching for me. 😕 But if you want a house part that’s pink to match your roof, maybe the pink tiled pavement could be an option. 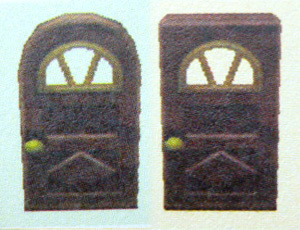 Teru has a great house parts page if you want to peruse that (and maybe they’re also in the guidebook you have). The silver can took me by surprise! It’s very handy, and I’m glad my flower hoarding paid off somehow 😛 Because it’s the same for me, my villagers are constantly planting flowers, and you can get them on the island tours as well. Thanks so much for the sweet compliments about my town and feedback about the cafe location, I appreciate it! 🙂 Yeah, I feel like there are pros and cons to both locations, so I’m having trouble deciding, and the fact that it’s permanent makes me want to put a lot of thought into it. A special garden in that space formed by the river would be pretty, I always think that the sound of running water in gardens creates a lovely atmosphere. You’ve gotten three manikins?! Wow! I haven’t got a single one so far, I should probably start buying clothes and accessories for the sake of cataloguing them rather wearing them immediately or storing them for a special occasion or season. And you got the contact option! How?! You’ve progressed so much more than me! I prefer the grey although I think the blue might better suit Estel’s image at the moment. The dreamy, calming kind of appearance. Either look great though! As for the Cafe, I’m not gonna offer my opinion because… Well… I can’t even decide for my own town, let alone someone else’s. The one place I’m considering is obstructed by a villager’s house so the whole project’s on hold for the time being. I didn't play City Folk frequently for a long period of time, so I didn't get many of those balloons, pinwheels, etc. I'd say that I like both roles for Phineas, and I definitely don't mind the change for New Leaf. I always enjoy hearing what he has to say about the different badges he gives. He's so good-natured and well-spoken! I like the badge addition too 🙂 I probably won't go out of my way to collect all the badges, and just occasionally receive one as a surprise for things I naturally do in my game (like the Good Samaritan badge). I just got a haircut the same day that Shampoodle first opened, and then I think a week or so later the contacts unlock. 🙂 I guess me getting contacts before you is a continued effect of the different release dates for our regions. Thanks, I think I like the blue-gray better too! I assume you mean Melba, haha, Mabel’s in every town! 😛 Aww, maybe you’ll get it next time! yeah.. It really does not help with the trees, does it? Hooray for Melba!! You got her so quickly this time 😀 Maybe you can help her get her cozy candy room back 🙂 Will you be keeping her for a while? You made good use of the butterfly tour ^_^ The area outside Estel’s house looks great! To me the fountains look “grand” rather than “official” :P, but statue fountains would look just as nice once they get requested. Estel also looks very nice with the blue contacts! I especially like the subtler blue-grey ones with her current hair and outfit. Personally I prefer having the Roost in the little nook (and that’s where I ended up putting mine! ), because of the two advantages you listed: it’s a scenic location for the lovely little cafe building and it allows the town hall and Lyra’s home more space. Depending how far back you set it, you could also still have a little park in front of it ^^ It’s just my opinion though! Can’t wait to see what you do with it! Yeah, I practically buy out Ables’ everyday for the sake of cataloging things. Ryann said that the last one’s from Gracie, so I guess I still have one more to go 😛 Haven’t seen Gracie yet in this game, but I guess she’ll show up at some point. I think a wooden color would be good for the mannequins, wish you could take them to Cyrus for that! That was my thinking too, maybe eventually I can try to restore her house to a similar style it was before. 🙂 It might be difficult with the carpet and wallpaper, though. I think starting with City Folk those items became rare exclusives to GracieGrace. I plan on at least keeping her for a long time, but if one day I can’t convince her to stay (like what happened to Choco with Tia), it wouldn’t be the end of the world since she’s still in Dafdilly. Well, as you can see, I’m back from my lovely hiatus of blogging and blog-commenting. Summer school demands your LIFE for those 18 days. As for The Roost input, I’m thinking Option 1 (seeing as I suggested it and all xD) because even if you were to put a garden there, there’s probably going to be a lot of traffic through there and the grass wouldn’t grow. :s But that’s just me. Actually, unlike everyone else, I seem to be getting new PWP suggests almost daily. Unfortunately, they’re mostly things I would never include in Miagen, like the caution sign and the yield sign, etc. HOWEVER, Bluebear gets it, because she suggested to me, within a week of each other, an illuminated heart and an illuminated clock. 😀 I was thinking that they might be too flashy at first, but I changed my mind. In the end, I demolished my fence and made a small park area out of the area with the illuminated things! Aww, hope you get a rainbow soon! I understand, I’ve taken summer classes before as well and they can be pretty intense (sometimes even more so than regular classes since it’s like a regular class crammed into such a short amount of time)! Aww, you’re getting on so amazingly well in your town! I still have to get persimmons and cherries, and I need them, as I can’t go ahead with some of my landscaping if I don’t have them. I’ve been cutting down almost every tree in town. It’s boring. And my villagers are just plain teasing me, asking for PWP I’ll never, ever want. I don’t think Odysseus would get a solar panel, parabolic anntena or caution sign. Oh, well. Wow, that’s a ton of WiFis. We could try again next week, but only try three times, otherwise we’ll just be wasting our lives away. If it doesn’t work, I’m going to glare at the router until it does. So, how ’bout the…what date’ll that be? 27th at 7pm your time, 3pm mine? Or is my math wrong? (School’s been finished a while now, and I need constant stimulation or my brain turns to mush.) So, yeah. Just I’ll go to your town – Ogygia’s a huge mess at the moment. You got your favourite! That’s so great, congrats! I have one of my favourites, Daisy, but I adore Kiki, who was my first-ever best friend. Bob is universally adored. It’s kind of strange the way everybody loves him. Estel’s pathway looks beautiful, and I think that the fountains work great, anyway. It looks a little like a Japanese player’s town, which is great, considering they got the game, like, a billion years before us (At least, that’s how it felt when waiting). Speaking of Japanese towns, have you visited Aika in the Dream Suite? I did recently. It’s meant to be a horror town, but I have a weird streak in me that made me laugh at the whole thing. I don’t know the Dream Address, but it’s easy enough to Google. Oh, and Daisy told me she’d had a dream about you. She said you were a happy tourist. Well, all right then. I like Café option 1. I think cafés should be relaxing places, and while it might be entertaining to sit and watch the world go by in #2, sipping coffee while watching villagers fish and all would be better. Obviously, you can’t REALLY see out the windows, but treating the game like it’s another layer of reality helps sometimes. As for the garden thing, it’s not like that nook’s the only bit of river in your town. You just have to be resourceful and all that, like see the small cranny or whatever by your first lake? You could do a little there. My café’s being built almost IN the lake by my waterfall. Seriously, there’s only one space between it and the water. But it looks cool and unique. I haven’t been bitten by a scorpion or tarantula yet. I felt very smug when I caught them without a bite. I love how you play so early in the morning! Sometimes, I mean to do that, but I don’t fall asleep for some reason until late, so it’s 9 am when I actually wake up. I’m disgusted with myself. I don’t think I have anything else to say. Hope we can Wifi (And it works). Wait, wait. For the Wifi I mean 7 MY time, 3 yours. Thank you! Though I still have a lot of work to do on my town before I’m happy with it, and it often gets messy while I’m working (with flower bags, saplings, and fruit baskets littered all over the place, plus all the flower storage I have on my beaches). I have a lot of tree work to do as well, lining the paths and such. I’m kind of dreading starting the process of axing and re-planting trees because I don’t even know if I have enough saplings and fruit to finish. I have cherries and persimmons, I’ll be sure to give some to you when we WiFi! 🙂 (And if it works!) Btw, I think you’re 5 hours ahead of me, so that would be 2 PM my time (which is still fine!). I haven’t been to Aika village yet, partly because it seems like it requires a bit of a time investment (reading up on the back-story and translations, and all the mazes and clues inside), and partly because I don’t think I would have the intended emotional reaction. I’m not easily scared by things that I know to be fictional, like books, movies, etc., and certainly don’t think I will be spooked by anything I see in an Animal Crossing town, no matter how cleverly it’s laid out. But if I did visit, I’m sure I would appreciate all the hard work that went into creating a town just for the sake of a dream, and for telling a story for others to enjoy! And the haunted aesthetic of the town looks interesting too — maybe not the way I would want a town of mine to look, but it’s unique and appealing in its own sort of way.